For April school vacation, I drove my family from Massachusetts to South Carolina and back. I’m pretty sure we did some other stuff too—I vaguely recall something about a beach, and maybe some miniature golf?—but the 2,200-mile round-trip drive effectively erased everything else from my memory. #1. Some deep-pocketed developer should buy a bunch of land and create a place of such concentrated Connecticutness that it can only be called East Newfieldingtonsbury. Will it ever be as posh or fashionable as West Newfieldingtonsbury? Probably not, but really, what is? #2. The Commonwealth of Virginia manufactures some of the finest traffic you’ll find anywhere—interminable, impenetrable, and utterly inexplicable. #3. Luckily, Virginia also has some excellent traffic signage. For example, a flashing display near Exit 162 informed us that Delays Continue Until Exit 148. I was skeptical at first—Fourteen miles of stop-and-go? At nine o’clock at night? But darnit-it-all-to-hell if that sign wasn’t right! Well done, Virginia! #4. One Virginia sign was a BIG disappointment though: Speed Limit Enforced by Aircraft. I’m sorry, but if you're going to promise something this exciting, I want an attack helicopter to swoop down out of the sky, latch onto my roof, and forcibly slow me down. At the very least, I expect to have the opportunity to break the speed limit...somewhere. Otherwise, y’all should just get real and change the signs to say Speed Controlled By God-Awful Traffic. #5. Our home state of Massachusetts is no signage slouch either. The examples of this are many, but my current favorite is: Speed Limit as Posted. I like the subtle implication that there are other, more mysterious regions where the speed limit is posted as one thing, but is secretly something else. #6. If there were a Nobel or Pulitzer Prize for signage though, you’d have to give them both to South of the Border, the sprawling South Carolina roadside attraction (restrooms, "food," souvenirs, fireworks, etc.) that narrates its approach through 200 ethnically insensitive billboards spread over 350 highway miles. Fill Up Yo’ Trunque Weeth Pedro’s Junque! South of the Border: 65 mi. Pedro No Shoot Ze Bool! Who Dunnit? South of the Border: 58 mi. Pedro’s Weather Report: CHILI TODAY – HOT TAMALE! South of the Border: 23 mi. None of them are exactly funny, and many are just moronic, but they gain power as a complete body of work, wearing you down with their persistence and omnipresence. 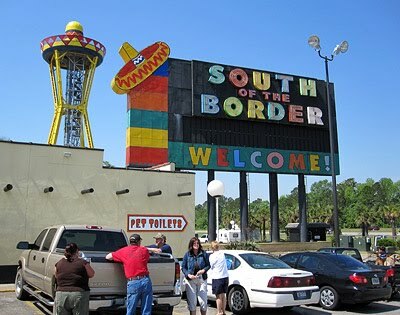 Case in point: I never wanted to stop at South of the Border, and yet…I still kinda wanted to stop there. Spring time roadtrips; always fun. The question is: did you bring back fireworks? No, I'm definitely too much of a scaredy-cat for fireworks. I just know I'm the guy who would accidentally blow off an appendage, or even manage to detonate them in the car on the way home. Hilarious! South of the Border reminds me of Wall-Drug, or the Corn Palace, with all its signs. I think you're right, Matthew--Wall Drug & SotB seem like they were twins separated at birth. Thanks for stopping by!